Indisputably, David was the most important leader of the Jewish people. 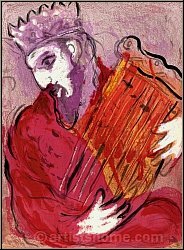 He wasn’t only a political genius – he united the Northern empire of Israel and the Southern one of Judah – but he was also a great writer and musician. He wrote major parts of the psalms, i.e. those prayers and songs that were summarised as a single book in the First Testament. 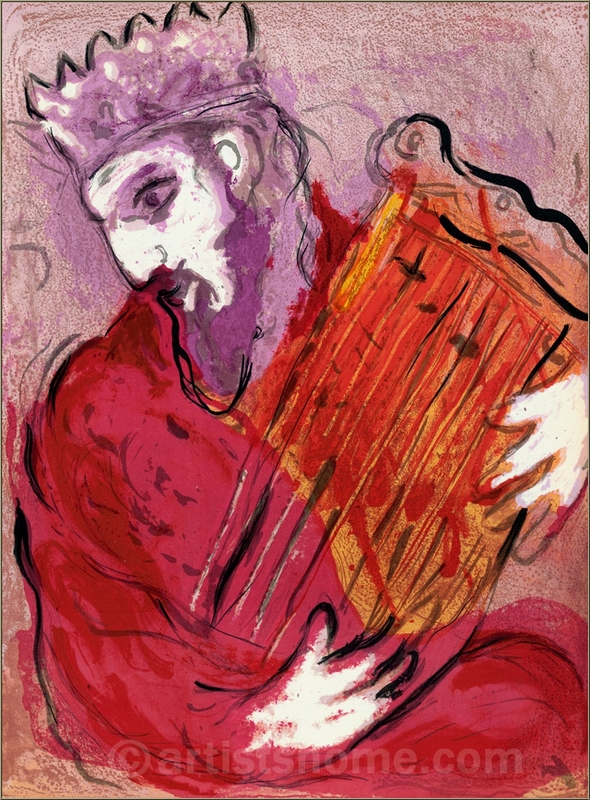 Chagall portrayed David in this piece with a harp which he knew how to play ingeniously. He is holding the instrument gently in his arms, his gaze seems pensive, and lost in thought. His face is glowing in white, which is a sign for enlightenment, bestowed by God? Chagall used the same white colour for Job’s hands, maybe because he also implemented what he had realised in his heart and his mind. 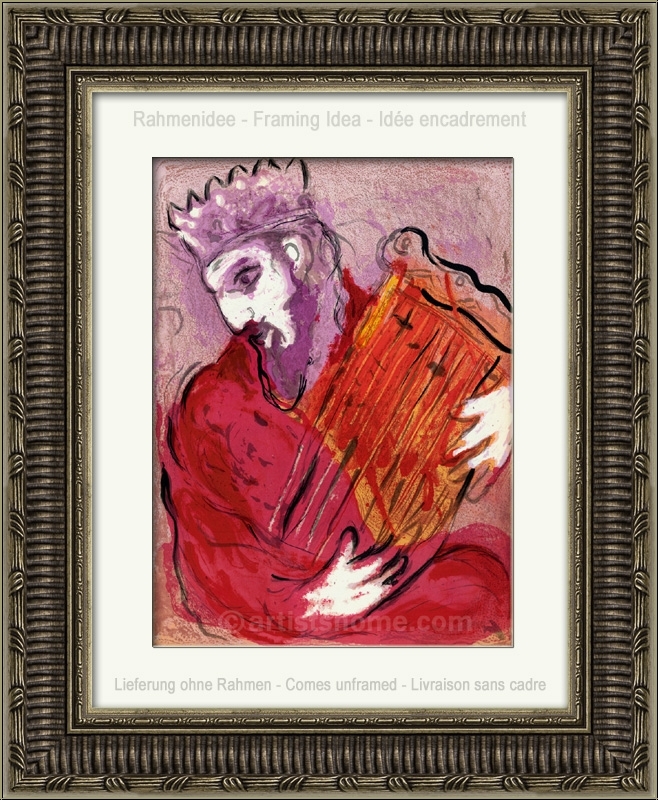 The purple background symbolises the presence of God, the real King and leader of Israel. 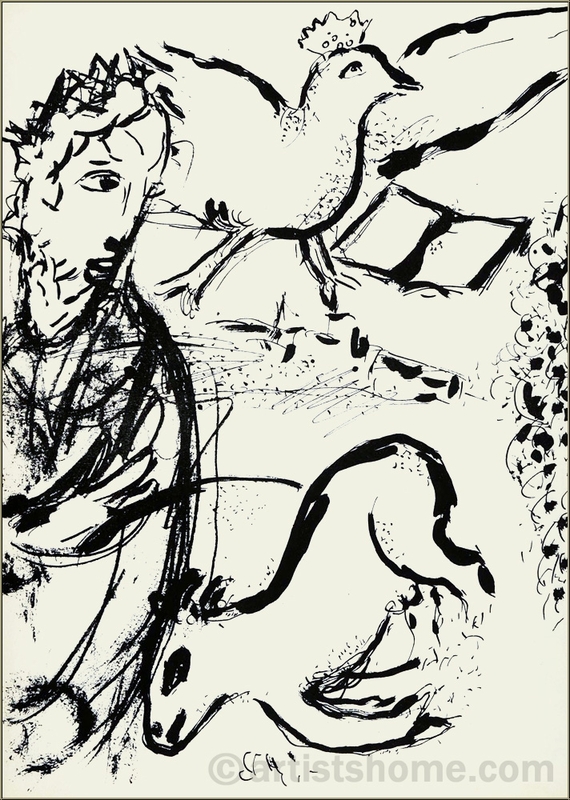 This is N O T a mass-produced reprint (photomechanical reproduction such as offset lithographs or giclée prints) but the original lithograph from Chagall's Bible I, exactly as referenced in Mourlot's catalogue raisonné. Edition / Paper: One of 6500 unsigned impressions for the book edition on strong velin paper. In addition, 75 pencil-signed and numbered impressions on Arches wove paper were published. Your print is being delivered with an abstract from the a.m. catalogue raisonné. In addition, you'll receive a proof of identity (without selling price in case this print is intended as a present).